Fried malagkit balls filled with custard and rolled in nutty sesame seeds. This delectable treat is deep fried under high heat before serving. 1. In a sauce pan, combine flour, cornstarch and water. Mix until completely dissolved. Add egg yolks and condensed milk. 2. Cook over low heat until slightly thick. Add FERNA BUTTINA BUTTER SUBSTITUTE & FERNA PRIMERA LANGKA FLAVOCOL, continuously stir until set. Set aside. 3. Pour over the ¾ cup water to malagkit rice flour. Combine well using fingers and knead until mixture becomes dough. 4. Shape dough into a long cylinder. Cut into 32 equal portions. Flatten using the palm of your hands. 5. Put 1 tbsp of langka filling at the center. Gather edges towards the center and seal very well. 6. Place cold water in a small bowl. 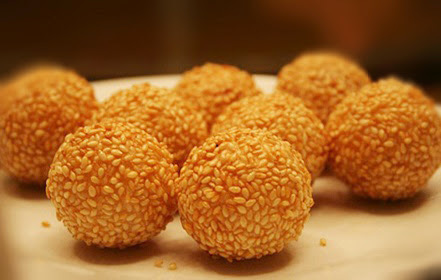 Quickly dip in each buchi ball and roll on a sesame seeds until well coated. Press sesame seeds gently for adhesion. 7. Heat cooking oil in a deep frying pan. Deep fry buchi balls until golden brown. 8. Drain on paper towels. Serve immediately. FERNA Corporation has all the ingredients of a certified food ingredients specialist. Food ingredients of highest quality. Advanced manufacturing technology. Innovative formulations. Global sourcing capabilities. International partnerships.